Peoria or Callaway handicapping is the process of handicapping the unhandicapped events with fully integrated handicapping to equalize any field. From the scoring screen, you can select several different handicapping methods. However, at times a group possesses several players, or a team does not have an official handicap. So, to give everyone equal opportunity to be competitive in the event, ViPER TM allows you to compute from the scores entered in a fair and equitable handicap. For this, out of two built-in processes; Peoria and Callaway, you can select any method. 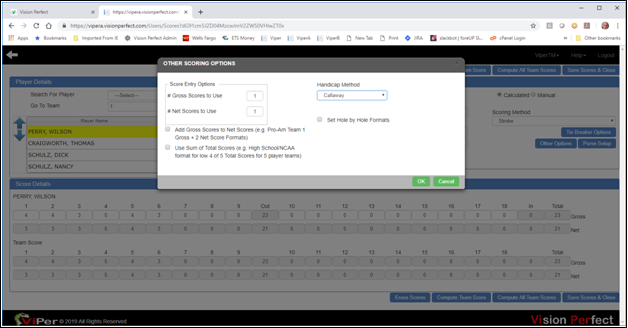 Peoria handicapping allows you to identify any number of holes to be used as players enter their scores. As a player or team enters the scores for each hole, the program will automatically determine the variance from par on the selected holes. Then accordingly, it will compute the player or team handicap. 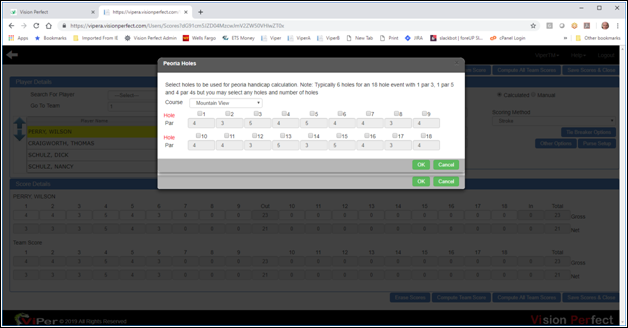 While using this format of computing a handicap for a player or team, the Viper-TM tournament manager employs the golf standards for using the scores entered so far and calculating the new handicap.